"Sandboarding and ripping around in the dune buggies was such a fun way to spend the afternoon. It made up for our disappointment with the oasis, which had looked like paradise in pictures, but in actuality was littered with garbage, a lot of which had even blown onto the sand dunes." 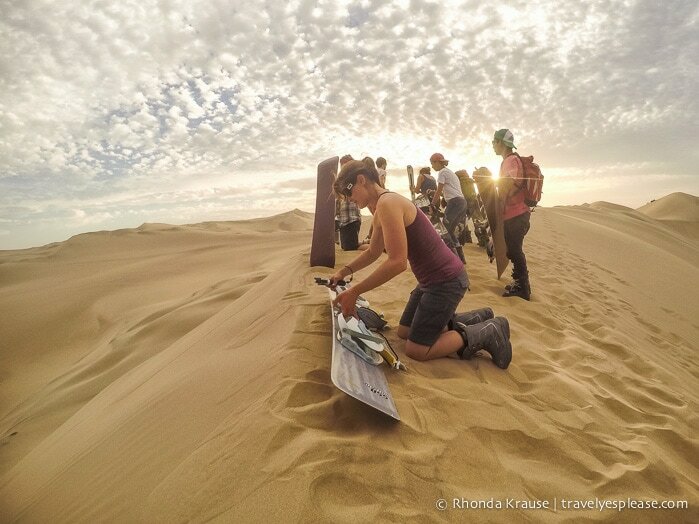 “I’m sandboarding in Peru!” I yell at my GoPro as I proudly surf down the wind-sculpted dunes of Huacachina. This is my first time sandboarding and I’ve got to admit- I’m better than I thought I would be. Maybe it’s because I have a good teacher, Victor “Dito” Chavez, a professional sandboarder and snowboarder who competes for Peru. Or maybe it’s because I’m not as scared as when I tried snowboarding. Falling on sand is a lot less painful than falling on snow and ice! No matter the reason for my “success”, and by that I mean being able to make it to the bottom on two feet, one thing is sure- sandboarding in Peru was a fantastic experience full of laughs!